Ideally located, at the foot of the slopes (50 m from the lifts) of the Courchevel area and the "3 Vallées" and shops of the resort. Practical: you leave and arrive on skis! In the evening, children can toboggan at the bottom of the building. The contemporary bathroom: bath / shower with mixer 'child safety', large mirror recessed, vanity unit. The second part includes water shower (with mixer 'child safety'), sink and hanging toilet. The 2 shower rooms have large dry soft towels. An additional WC, independent, full equipment. Contemporary kitchen with fridge / freezer large capacity, 2 ring induction hob, multifunction oven with grill, microwave and 'convection', dishwasher 12 place. Dining table with 2 extensions for up to 10 guests. Lounge: 2 sofas and a flat screen wall-mounted TV with adjustable support - LED 32 "(81 cm) HD tuner with HDMI and USB media (movie, photo, video, music). Master bedroom: 2nd TV 32 'TNT HD with HDMI and USB media. + 7 beds are offered an extra mattress. Duvets 'WINTER' superior quality treated anti-mite and anti-tasks accompany each sleeping. (140 x 190 for single bed and 240 x 240 bed 140). To break relaxing balcony / terrace, tiled, has a table and four folding chairs. Bed linen and towels are not provided but this service may be offered by the concierge service 'KEYS WHITE'. Since many years we, the two mature couples, go together for skiing. This year we chose Les 3 Vallees and while we liked the skiing area, it has been our worst ever experience with the accommodation. The headline for this apartment is "Beautiful 3 rooms for 7 people". In fact, it might be an option for a family with 2/3 kids at most, but not for any other constellation of people. The apartment is very tiny: one very small bedroom, filled completely with a double bed, so there is literally no space around; one claustrophobic niche with two bunk beds, and the rest of the apartment, consisting of a kitchenette, dining area and living area - all together. So the 3 sleeping places are on a small double sofa and one single sofa in the living room. Such accommodation might be OK as a low budget option but not for the proce we paid. On top of everything, shortly before our arrival, we had been informed, that we would not get bed linen and towels ! If we do not want to bring our own, we can rent them from the concierge for a ridiculously high price. The apartment is in an ugly, 9 floors building, with a smelly and dirty ski room. The only positive thing in that apartment are the bathrooms; there are 2 of them plus a separate toilet, all in decent condition. All in all - this was certainly not a value for money. Nice but small, ok for 2 adults and 3 kids but wouldn’t want to spend longer than a week or with more people. Great location for skiing 3 valleys, great slope side access. Checks of equipment need to be done carefully as some things were missing... stool... rug! Concerning the apartment, we bring the biggest care about the layout of the apartment: Concerning the carpet (used) and the stool that had just been broken, they are being replaced. In January, we re-equipped the apartment with broken glasses and crockery and the replacement of bedding covers for all mattresses. We remain at your disposal and hope to see you again for a future resort. Nous sommes ravis que vous ayez apprécié votre séjour. la Tania est une jolie station piétonne et notre appartement offre l avantage d'être très proche du départ des œufs pour le domaine des 3 vallées (Très appréciable : départ et arrivée "ski aux pieds). Concernant l'appartement, nous apportons le plus grand soin a son aménagement. Concernant le tapis (usé) et le tabouret qui venait d'être cassé, ils sont en cours de remplacement. Nous avons rééquipé en janvier l'appartement de verres et vaisselles cassés ainsi que le remplacement de housses de propreté pour tous les matelas. Nous restons a votre écoute et espérons vous revoir pour un prochain séjour. Great flat in a great place! 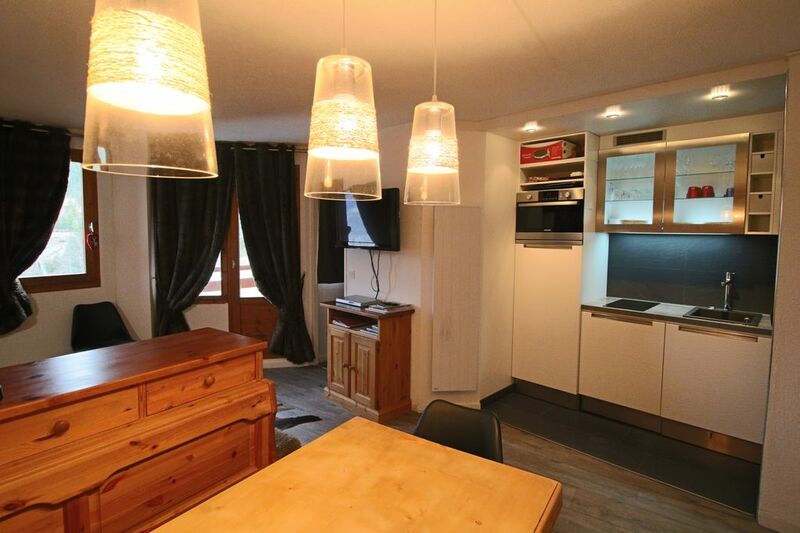 Perfect ski in ski out location and a well equipped flat. We had a brilliant stay and could thoroughly recommend it. We are delighted that you have enjoyed the Tania ski area and the apartment with all its amenities. We remain at your service and will welcome you again with pleasure. Close to the gondola, ski in ski out. Fab resort, great atmosphere and very friendly. We loved this apartment. It was 50m from the main lift out of the village, with the ski lockers on the way out so very convenient. The apartment has been recently decorated so is lovely. The kitchen was well equipped for self catering and even had a raclette machine which was great! Tea mugs now provided for the british tea enthusiast, and a tea pot so no need to bring your own as we did. Picking up the key was easy and the man spoke perfect english so could answer any queries. Make sure you fill the itinery out as soon as you arrive as I struggled to complete once we had started using things. Matresses aren't amazing but what do you expect really. Could maybe do with some better pillows but that is my personal taste. We were a family of 7 and it was fine for us as we know each other well. Might be a little less convenient for friends but the separate bathrooms are a great idea. There is a car parking space but we couldn't access it, as the barrier was broken so just parked in a free spot all week. To access the apartment if unloading a car I would recommend going to the back of the apartment block and getting the lift to level 9/10. It will make sense when you are there. A great week and a great apartment, so thank you! Arrive at Moutiers (Tarentaise valley), take direction 'Courchevel'. Continue until a roundabout, turn right La Tania indicated. Le ménage non effectué au départ des locataires sera facturé en plus. Les locataires peuvent s'adresser au service de conciergerie "Les Clefs Blanches" pour demander un ménage. Une caution de 1 000.00€ sera demandée au locataire en garantie. Elle sera payable a l avance par chèque ou virement.